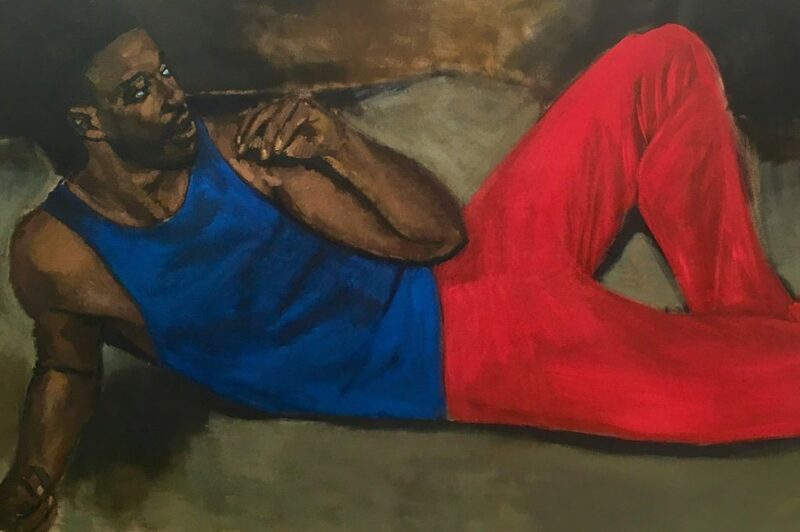 Lynette Yiadom-Boakye’s exhibition Sorrow for a Cipher at Corvi-Mora displays a new series of her paintings that fill the gallery’s main space. The South London-based artist has received a huge amount of international acclaim over the past few years and this show serves to demonstrate that her work is still just as vibrant and original. Yiadom-Boakye doesn’t work from life and those she depicts in her paintings are entirely from her own imagination and usually made in a single session. Her new range of fictional subjects are all black and male. They are less active and assume more reclining, thoughtful poses than in her previous work. There is also a more somber attitude that could be attributed to them. But Yiadom-Boakye’s sitters are by no means passive. Their muted colours, reflective faces and the fact that they are not drawn from life makes them no less vibrant. The improvised way in which they were created only serves to give the pieces a magical energy. Yiadom-Boakye’s imaginary subjects are as fully formed and lifelike as those who go to look at them. The canvases are often backed with extremely bright colours which show through the faces of the subjects and sitters and give them a backlit glow. Beneath the sombre blacks and browns an eye will have a fleck of blue or a jawline edged very slightly with purple. The layering of the oil paints makes the work vivid and psychologically charged—they seem emotionless but not blank. Yiadom-Boakye’s vigorous use of paint also makes her work very physical, and the oil against the canvas provides a varied, textured appearance. They can be both rough and choppy but also smooth and serene all in the same piece. This variation as well as the contrast of colour used means that the paintings have much to offer from afar as well as up close. It is worth getting up close and personal to appreciate technicality as well as stepping back in order to understand the characters as a whole from from a distance. The paintings also interact with each other, which one realizes when walking around the room. Yiadom-Boakye’s figures build on from one another and seem to communicate knowingly with looks or signals. Some are turned away in thought but others acknowledge the presence of the viewer with a direct gaze. It also seems that the same figures often re-occur in different pieces or exhibitions and one can find familiar faces. Sometimes the figures are seated in front of a back-drop of colour or pattern. Two of the subjects hold birds as though they were props or ornaments for display. 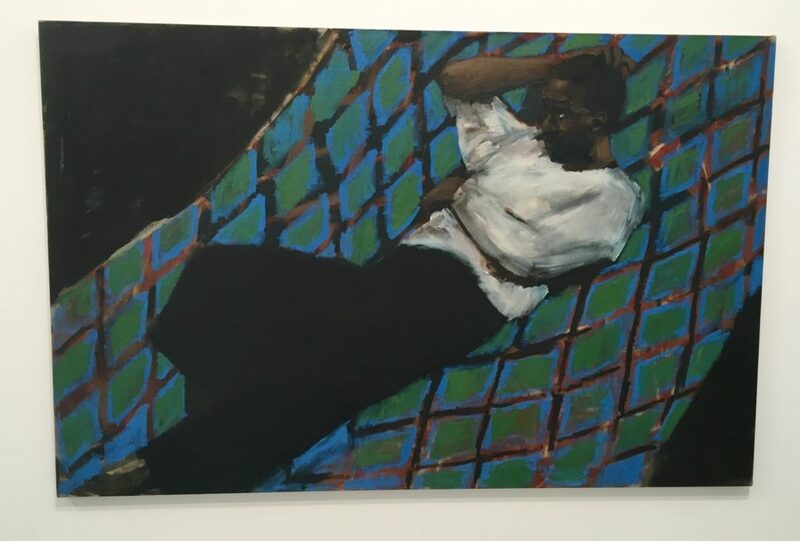 There seems to be some acknowledgment of classic art history portraits in these aspects of Yiadom-Boakye’s work and therefore a twist of tradition. These portraits are both traditional as well as modern, the figures are timeless but also present in the here and now. 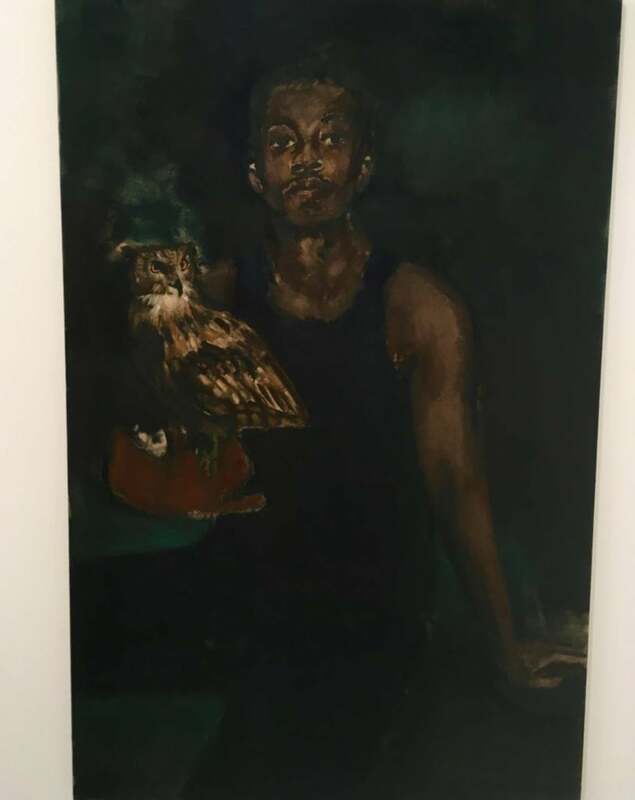 Lynette Yiadom-Boakye’s exhibition runs until the 8th of October and is well worth a visit!